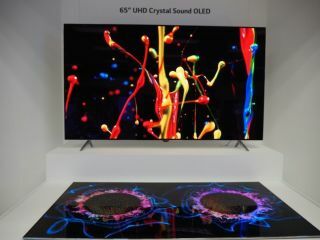 LG demos Crystal Sound and Wallpaper OLEDs, plus double-sided and transparent TVs | What Hi-Fi? LG is showing what it expects to be the future of TV at CES 2017, with a whole host of fantastical screen technology on show. LG's panel company, LG Display, isn't only concerned with screen technology, as the company's "Crystal Sound OLED" television demonstrates. This technology embeds a sound system in the panel itself, which it says makes for a more immersive experience. The sound is projected as if coming directly from the characters, rather than "off-centre sound from speakers", according to LG. These displays will come in 55in and 65in models.